The average vehicle wrap is seen 40,000 times per month. Even if somebody doesn’t need your product at the time, by seeing your vehicle wrap, you will stay top of mind. If you are driving around, why not be advertising? If you own a vehicle, own a billboard! It’s simply a numbers game. The more people see you, higher volume of leads and sales will follow. Unlike forms of advertising that require a monthly expense, a vehicle wrap is a one-time expense that keeps working for you. Bring in your designs or work with us to create something great! We will also show you a preview before printing anything. We use the best printing technologies in the industry that will create the highest quality vinyls for the vehicle of your choice! We employ a team of experienced installers whose primary job is to ensure precise placement of wraps on your vehicle! At Queen of Wraps, we offer the best advertising wrap around. 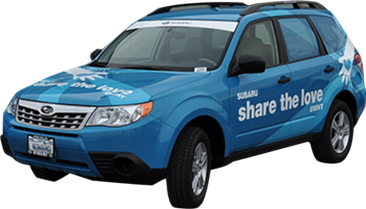 Whether you are looking to have graphics on one vehicle or a national fleet, we have the capability to help you out. More than 10,000 Vehicles Wrapped and Counting!